“June Gloom” – It’s a southern California term for a weather pattern that results in cloudy, overcast skies with cool temperatures during the late spring and early summer. We should be so lucky in Oregon! Our “May Grey” was followed by a full on rain storm today. Surprise, the first week of June is heavy rain and to top it off there is the forecast of snow down to 3000 feet in the cascades. It turns out that I took the day off work and planned to attend the Team Oregon Advanced Rider Training (ART) with some rider friends. In the paperwork, Team Oregon made it very clear. Regardless of the weather, rain or shine the one-day course would happen so come prepared. You see ART is not a high speed, racing-oriented class, but it provides riders a chance to build skills on an enclosed track while getting feedback from expert instructors. It’s designed for the rider who has at least 12,000 miles of current, on-street riding experience and includes 4 hours of range (riding) instruction including cornering, braking, swerving and traction management. So, I put on the rain gear and departed the house in heavy rain to take on the morning rush hour traffic. 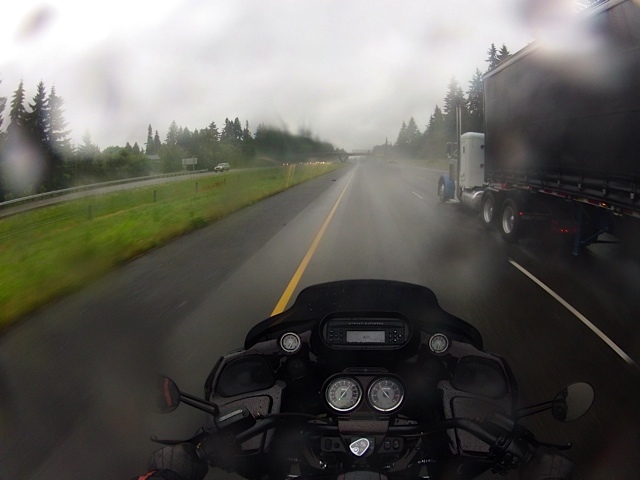 Merged onto I-5 with the visible oil sheen and “rooster tails” from semi-trucks while watching a couple of folks on their cell phones – I suppose they had to tell friends just how wet the roads were – to arrive 35 minutes later at the Pat’s Acres Racing Complex and learn that the instructors cancelled the class! Huh? And get this… because the track was too oily and wet. Are you tracking with me here? It’s Oregon! Duh. I just spent the morning on an oil slick I-5 corridor accelerating/braking in stop-n-go traffic, making lane-change transitions, passing semi-trucks while thinking about my traction judgment and then safely existing the freeway and smoothly cornering through the curves of the Canby ramp only to find out that Pat’s “little race track” has an oil sheen and the rain made it slippery when wet! Are you kidding me? Really. Who are these people?! Isn’t the idea of this course to help riders improve judgment and skills by linking turns and choosing better lines in the rain. To get better in the type of weather conditions that are fairly routine in the Northwest. And to practice on a closed course vs. on the interstate, right? So let me get this straight. The weather is too challenging to learn, but it’s okay for riders to head back home in the very same conditions that required them to cancel? Worse yet was the fact that several people had called 30 minutes prior to the start of the class and obtained confirmation that it was still on. I’m sure the Team Oregon office in Corvallis didn’t appreciate my phone call. But, they did hear my “pull your head out” message and where to send my refund! That’s the mantra we’ve heard over and over the last couple weeks on the remembrance run up of the horrific attacks of September 11, 2001. Within 24 hours of the attacks the first newspaper had already labeled the site in New York as “Ground Zero.” If anyone needed a sign that we were about to run off the rails, as a misassessment of what had actually occurred that should have been enough. Previously, the phrase “ground zero” had only one meaning: it was the spot where a nuclear explosion had occurred. But, in certain areas of our collective lives everything did change. It was an accurate description. Security increased. The U.S. went to war in two far-away lands. Ugly barriers went up around public facilities. Navigating airports became a new kind of nightmare. And since 9/11, counterterrorism has been the FBI’s No. 1 priority, consuming the lion’s share of its budget—$3.3B, compared to $2.6B for organized crime—and much of the attention of field agents is a massive, nationwide network of informants. After ten years of emphasizing informant recruiting as a key task for its agents, the bureau now maintains a roster of over 15,000 spies—many of them paid $100K per case. Then there is the heightened “ten year” terror threat. It was frustrating to search the news for facts. Dozens of stories, all using the same stilted cop jargon, told us to be suspicious of every unattended car and empty milk carton we saw, but to bravely go on about our business. Someone said they heard there were truck searches in downtown Portland. I haven’t seen anything like that, but who knows. The advice is to be suspicious of suspicous swarthy passers-by. Hows that for being politically correct?! Some will debate that the event has been used as an excuse for two wars, runaway military spending, and the stripping down of our civil liberties. For me the saddest thing is that the victims of those suicidal monstrosities have been misused ever since. While I agree that it’s not a good idea to waste a lot of time nursing hurt feelings. Or is it a good idea to wallow in the past either. Too much of the 9/11 ceremonies seems to be doing just that. That and photo ops for our leaders. Don’t get me wrong, the morning of September 11, 2001, gave me one of the biggest shocks of my life. It’s right up there with the day Kennedy was shot. I can give you minute details of where I was, what I was doing, how I found out what had happened, and how shaken I was. But does anyone else find these overdetermined celebration and remembrances troubling. We do need to remember the day we were attacked and should never forget the fathers, mothers, sons, and daughters who lost their lives or the families that lost loved ones on that day. We should never forget the first responders who rushed to the aid of NY that day. But, shouldn’t the remembrances be more private? All of that said, I do want to express the sadness I feel for those who lost special people on 9/11 and in our ongoing wars. 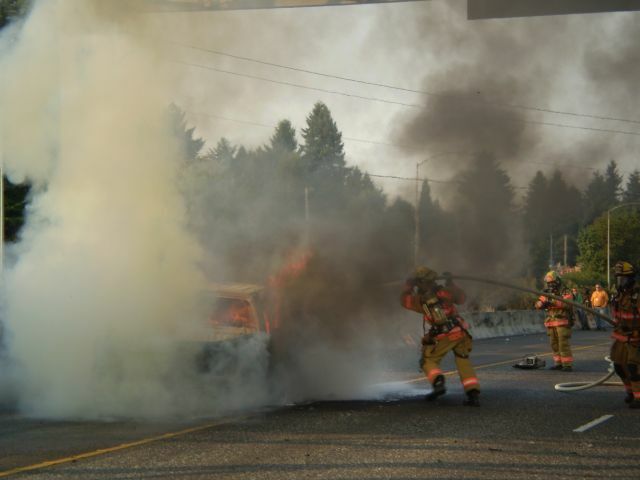 Photo courtesy of OSP… First responders on scene of a truck fire on I-5 this week. A while back and I don’t recall now how, but I subscribed to an Oregon State Police newsflash service. I don’t forward OSP news, but this is rather significant and involves multiple motorcycles. At 2:54 (Pacific) there was an OSP report of numerous motorcycles northbound on Interstate 5, near milepost 282 south of Wilsonville who were involved in a crash. One lane northbound is now open following a multi-vehicle crash involving 26 motorcycles. The accident was on I-5 near the Baldock Rest Area and involved two motorcyclists taken by LifeFlight with critical injuries and eight others transported by ground ambulance to area hospitals. Preliminary information indicates a group of at least 26 motorcyclists were northbound in the left lane on I-5 following a passenger vehicle when traffic ahead began slowing. The car and motorcyclists all tried to slow but collided with one another. A vehicle in the middle northbound lane was reportedly struck by one of the motorcycles. All northbound lanes were closed until about 4:00 p.m. Traffic is reported slow but getting through in one lane. Southbound lanes are open but also very slow. Let’s hope for only the best to those injured. I’ll provide updates as I learn more. UPDATE 1: Video and still shots taken by Sky8 indicate some of the motorcyclists were members of the Brothers Speed Motorcycle Club. See HERE and HERE (Source: KGW News). 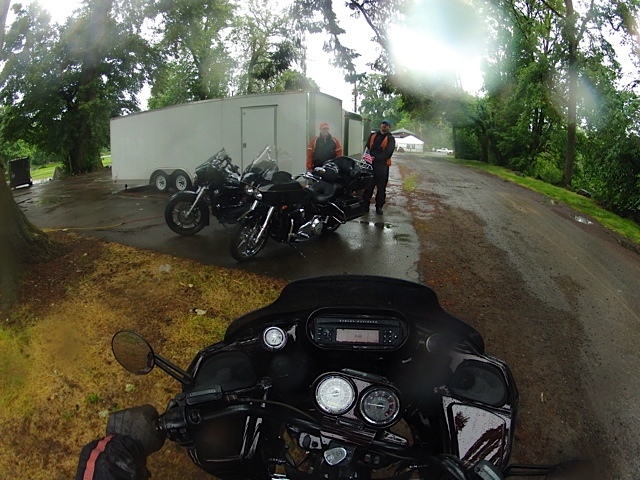 UPDATE 2: KATU and Jet Ranger 2 provide video coverage HERE and confirmed motorcyclists were BSMC members. UPDATE: September 19, 2009 — The official report is that ten were injured, two critically. Several others involved in the crash were attended too on site by medical personnel, but declined transport to a local hospital. 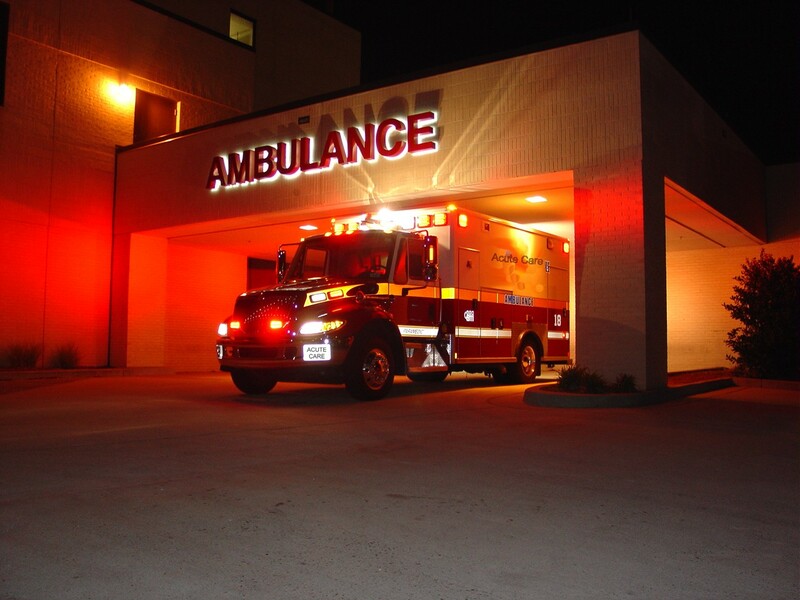 Herbert Sinclair, age 48 (Heyburn, ID) and David Bowyer, age 44 (Coeur d’Alene, ID) were transported by LifeFlight to OHSU and Emanuel Hospital respectively. Names of three others injured in the crash were identified as Jaun Ramon Mata, age 60, Christian J. Gankema, age 40 and Gary Pawson, age 38 all from Idaho. Cause of the accident: was reported as a group of 26 BSMC motorcyclists traveling in a formation of two columns on the inside left hand lane (I-5 North) came upon slowing or stopping traffic. The two front motorcycles maneuvered to avoid a collision with the stopped vehicle, but the rest of the group did not react in time and crashed into the vehicle and into each other. The total number of motorcycles that actually crashed was not confirmed. On scene photos provided by OSP HERE, HERE, and HERE. The group was heading north to take part in the Portland Chapter annual birthday bash and weekend demolition derby. UPDATE: October 5, 2009 — Sadly it was reported today that David “Detroit Dave” Bowyer from Coeur d’Alene, ID passed away at Legacy Emanuel Hospital where he was being treated since the crash on September 18th. UPDATE: October 8, 2009 — Detroit Dave’s sister set up a memorial site HERE with information on the funeral services. The BSMC have been posting updates HERE along with information about how you can contribute to a crash fund. The AgingRebel blog has comments posted by “Not Surprised” which provides more detail on the SUV drivers (Leslie D. Schultz — Toyota 4 Runner and Kayla D. Knight — Nissan Pathfinder) which has not been previously released by the media to the public. There were rumors circulating about ATF personnel in the SUV’s, but this was not the case and although the accident continues to be investigated at first glance nothing sinister jumps out about this accident. Photos courtesy of Lifeflight.org and OSP.